Despite the political impasse over how to extricate the UK from the European Union, the bloc’s name is already being removed from its passports. A longstanding decision to introduce passports without the EU header took effect on March 30 — the day after the original date for Brexit — the UK Home Office confirmed. 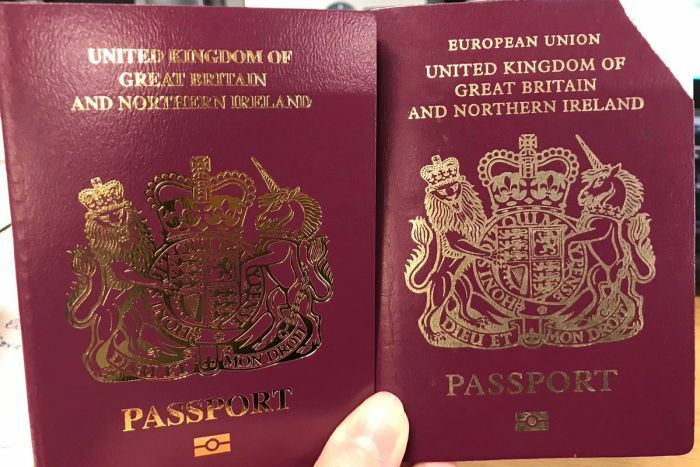 In a statement, it said passports bearing the words European Union would continue to be issued for a period to make use of leftover stock, but “you will not be able to choose whether you get a passport that includes the words European Union, or a passport that does not”. The decision earned the ire of British couple Peter and Jan Brady who were issued different passports — despite lodging their applications on the same day. “For me to have the European Union wiped completely off my passport is good news,” Mr Brady told the BBC, adding his partner was “very unhappy” at having received a passport with the EU label on it. But others such as Susan Hindle Barone, who received her new passport on Friday, said the move left her “truly appalled”. “I am furious … I didn’t notice it until I looked at them next to each other. It makes me feel sick,” she wrote on Twitter. The Home Office has warned the residents will not be issued passports that include the words European Union after the UK has left the EU — but when that is likely to be remains uncertain. Britain is slated to leave the EU without a withdrawal deal in place on April 12, but British Prime Minister Theresa May has sought to once again delay Brexit to avoid a chaotic exit. Mr Tusk has proposed a longer time frame, urging the 27 remaining EU nations to offer the UK a flexible extension of up to a year to make sure the nation does not leave the bloc in a way that could undermine commerce. Despite the uncertainty, Home Secretary Sajid Javid said it was only “sensible and efficient management” to begin transitioning to passports without EU headers. “There shouldn’t be any surprises that almost three years after the country voted to leave, [UK Home Office] is getting on with implementing that decision,” he wrote on Twitter.